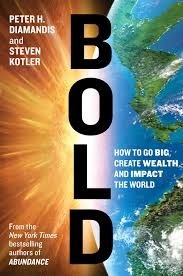 Bold by Peter Diamandis and Steven Kotler was a follow up to their 2010 book Abundance (which I wrote about last year) and it's noted early on in Bold that the book written as a sort of a playbook for accomplishing the things that can solve some of the world's biggest problems and bring about abundance. Bold is divided into three sections with the first on bold / exponential technologies, the second on the psychology of the book as well as current innovators and third on detailed how-to steps that Diamandis and Kotler lay out as recipes towards business success. The first section was the most compelling to me and the idea of exponential technologies relates to technology advances multiplying again and again (in the same fashion of the Moore's Law concept that the number of integrated circuits on a transistor will double every twelve to twenty-four months) and that exponential technologies means that advances or entirely new business areas create the potential for additional advances and other areas to build on top of them. Some the examples of industries and companies that Diamandis and Kotler note in the exponential technologies section include: 3-D printing (which enables industries and companies like Made in Space), self-driving cars (it didn't seem to be spelled out in the book, but this would create the ability for an entire ecosystem around providing services, likely through apps, to people who no longer need to pay attention driving while in their car), networks and sensors (what the Internet of Things is about), artificial intelligence (with one usage for AI being the analyzing of data from all the networks and sensors), robotics (including drones), and entirely new developments in the medical field (synthetic biology and personalizing medicine, which brings to mind the scientist Eric Schadt who I've several times linked to articles about). Additionally Diamandis and Kotler give as examples of exponential technologies that operate at a platform level Kickstarter, Airbnb and Uber. The second part of the book about the bold mindset includes mention of companies and organizations that have successfully employed skunk works (a group apart from the rest of the business) to bring about innovation, the Google X group led by Astro Teller that aims for 10x or 1,000 increases in performance, and the company Planetary Resources that Diamandis and others created to mine asteroids for materials. Additionally included in this section were profiles on Jeff Bezos, Richard Branson, Elon Musk, and Larry Page. The third section was titled the bold crowd and included pretty in-depth details and instructions for people in the areas of crowdsourcing, crowd funding, building communities, and incentive competitions. Overall it was a solid read and details about Bold were posted by Diamandis with "11 Steps for being Bold" to his tumblr blog.